ProTools | HD Native is a new generation of Pro Tools | Ultimate system that enables you to compose, record, edit, and mix music and/or sound for picture—with great speed and ease. Consisting of an HD Native Thunderbolt interface, Pro Tools Ultimate software, and Pro Tools HD Series interface, Pro Tools|HD Native harnesses the power of your Mac or PC to deliver pristine sound, incredible performance, and the lowest latency of any host-based DAW. This option includes Pro Tools Ultimate software as well as annual support and upgrade plan giving you access to 25 bonus plug-ins, support direct from Avid and access to the latest Pro Tools Ultimate 2018 releases. Write, record, edit, and mix music and/or sound for picture with exceptional pace and ease with Avid ProTools HD Native, the next generation of Pro Tools Ultimate system. Pro Tools HD Native capitalises on the capabilities of your workstation to create sparkling audio, exceptional performance and the lowest latency of any host-based DAW thanks to an HD Native Thunderbolt interface or PCIe core card, Pro Tools Ultimate software, and Pro Tools HD Series interface. 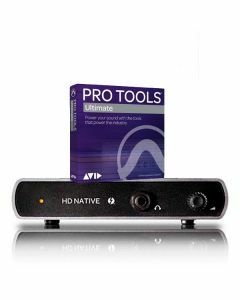 Pro Tools|HD Native utilises either a high-speed Thunderbolt interface to connect Pro Tools HD Series interfaces with your laptop or desktop computer, as opposed to USB- or FireWire-based DAWs, which are intrinsically prone to latency. By removing disruptive monitor latency while recording, improving your I/O capabilities and providing 64-bit floating-point processing for more headroom and a higher mix resolution, the user receives a professional native solution. Simultaneously record and monitor up to 64 inputs and outputs, create huge sessions with up to 256 audio tracks and 512 instrument tracks and deal with the most intense virtual instrument and plug-in-heavy mixes, easily. Combine the HD Native Thunderbolt interface with a single rack space HD OMNI audio interface and your laptop. You’ve now got a fully portable, full-powered recording rig. Or with just Pro Tools Ultimate software on your laptop and your iLok compose, edit, and mix for simple mobile creation. Liberate yourself from the confines of the studio and create wherever inspiration takes you. When recording, the smallest distraction can affect your performance. The most frustrating—dealing with the latency USB and FireWire-based audio interfaces can bring. That’s why Pro Tools | HD Native elevates your recording experience with a high-speed Thunderbolt connectivity. This nearly eliminates that distracting delay you hear while recording, leading to better performances. With the Thunderbolt interface, you even get an audiophile-grade headphone output to hear every detail.